Many of the images were bleak: sunburned soldiers sprawled over their cots in the crushing desert heat; deep drifts of sand with boot tracks leading to three green Port-o-johns; an Afghan solider in a doorway below an ominous mound of sandbags with a transistor radio pressed to his ear. Then there was an American soldier standing in a lush field, exhaustion written all over his face. The temperatures had reached 120 degrees that day, and the men had been carrying 100 pounds of gear through dense, humid fields. 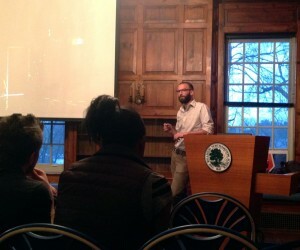 Photographer Ben Brody took a long look at the picture, projected onto a screen in the Dodge Room, Reed Campus Center, where he was presenting the last seminar in the 2014 Photographer Lecture Series. “He was killed six weeks after I took this photo,” Mr. Brody explained of the solider whose portrait he had taken. In one way or another, Mr. Brody has been covering conflicts in Iraq and Afghanistan for almost a decade. While he notes that a “major feature of being at war is boredom,” Mr. Brody’s coverage of the conflicts—both as a U.S. Army combat journalist and a civilian—have also led him into dangerous territory, from firefights to medevac flights. Mr. Brody, who spent 28 months in Iraq as a soldier, has returned to Afghanistan six times, for six to eight week stretches at a time, as a reporter embedded with the military. Speaking to Williston students, faculty, and community members, he noted that his work had required continued military protection and aid. 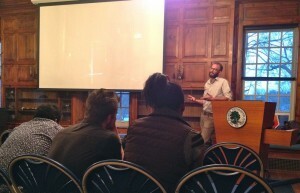 In return Mr. Brody said his job was to document the war for publications such as GlobalPost—not create art. Even so, Mr. Brody’s style of photojournalism, where the image cannot be altered in any significant way after it’s taken, requires a certain amount of finesse. During his April 29 lecture, Mr. Brody explained how he used his laptop as a “digital darkroom,” used one camera per lens to avoid ruining delicate equipment in sand-filled locations, and once rigged his camera battery to a car battery to recharge it. For a GlobalPost piece on medics, Mr. Brody also wore a GoPro camera on his helmet to capture the moment-by-moment account. He later wrote a piece in the first person to go with images of the medics at work. Still, with American troops pulling out of Afghanistan and the military drawdown well underway, Mr. Brody predicts his time as an embedded reporter in Afghanistan will shortly come to a close.